The life of a cannabis plant starts with the germination of the seed. In these first days it is crucial to offer the seedlings the best possible start into life, nourishing the tender plant into a thriving organism. The easiest and most convenient way to control the complete environment during this stage is by using the a Smart Start - designed for optimal germination. First of all, you need a few things to use in conjunction with Smart Start. These are some perlite, a propagator (ideally the Propagator Pro), something for poking holes in soil (such as a screw driver), a litre of room temperature water, and some sticky tape. First of all, the feed is dissolved in the litre of water. This feed contains activating bacteria that work with the compost to create the ideal environment for a seed to flourish. Next it is time to set up the propagator. Place a thin layer of perlite into the bottom of propagation tray of your propagator, then place the smart start pots containing compost on top of it. Give the pots and perlite a small amount your water solution to moisten them, but do not soak them – waterlogged compost is bad for seeds. The water level should end up well below the perlites surface. This will allow the pots to absorb water through the perlite over the coming days, without becoming waterlogged. It will also help keep the air inside propagator nice and humid. Now that everything is setup, it is time to put seed to soil. Take your screwdriver and measure somewhere between five to ten millimetres from the end of it – marking it so you can see the measurement. Use this mark to make a five to ten millimetres deep hole, central within the soil of each pot. Pop a seed in the hole of each of your pots, and cover them lightly with soil – so that they are covered without being compacted. You don’t need to worry too much about the orientation of the seeds as you put them in, as they are one of nature’s little beauties they will naturally grow towards the surface, whilst the root heads downwards into the soil for water. Now all you have to do is wait. It should take 1-8 days before you see a seedling sprout through the soil. Do not get impatient and try and sneak a look – you could do more harm than good. Just let nature take its course. Throughout this time, make sure that the perlite remains moist – without ever becoming too wet or dry. When your seedlings do finally emerge, a few of them may still have the seed casing over them. Unless you are very experienced, leave this. It will naturally fall off, and trying to do it yourself could damage the cannabis at a very vulnerable stage of its life. Keep the conditions within your propagator constant until each of your seedlings is 2-3 cm tall. Now carefully remove each seedling from their Smart Start pots, keeping the compost intact, and taking extra special care not to cause any damage to the roots or shoot. 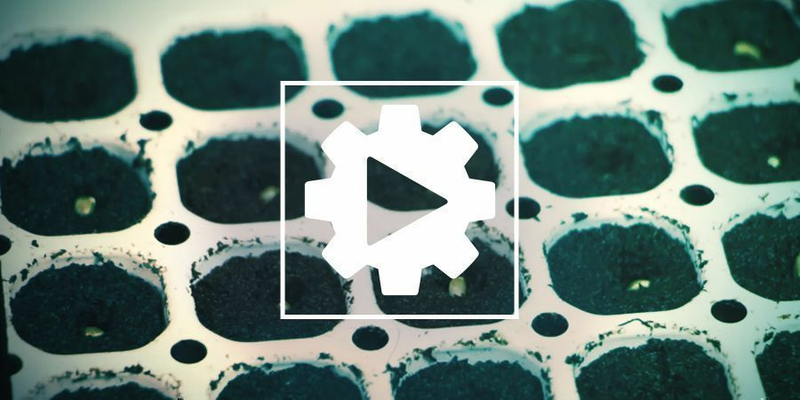 Place the seedling and compost directly into your growing medium. There you have it, you have now successfully germinated your cannabis seeds using Smart Start, and given them a strong and healthy beginning to life.